She loves racing, has a passion for horses and is great at winning not just any race, but the historic races such as the Queen’s Plate. It should therefore come as no surprise that veteran horse conditioner Josie Carroll finds herself being inducted into the Canadian Horse Racing Hall of Fame amongst a superb fleet of standout Thoroughbred trainers. Yet, with all her experience and numerous visits to the winner’s circle in the last couple of decades, Carroll is more than humble on learning about her induction into the Hall of Fame. “I’m very honoured. This industry means a lot to me. I’ve really made it my life and to receive an honour like that, it’s pretty overwhelming,” said Carroll, who ranked as the fifth leading trainer for earnings at Woodbine last season. While Mildred Williams was the first female driver and trainer to be initiated into the Standardbred Hall of Fame (2012), Carroll is the first female trainer to be inducted into the Thoroughbred Hall of Fame. She will join an extensive list of veteran conditioners that includes names such as Lucien Laurin, Donald Campbell, Arthur Warner, Horatio Luro, Macdonald (Mac) Benson, Roger Attfield, Mark Casse and Reade Baker – just to a name a few. Interestingly, and unlike some of the trainers gracing those walls, Carroll has no family background in racing. She didn’t grow up on a farm or a ranch. Rather, her initial interest was sparked indirectly by way of the media’s spotlight on the sport. “Actually, it was a time when horse racing got a lot of coverage in the newspapers and I started following it from very early,” said Carroll, who went on to pursue an equine program at Humber College before taking a placement at Woodbine. In 1975, Carroll began working under the tutelage of Hall of Fame trainer Mac Benson. She has also worked with fellow Hall of Famer Roger Attfield as well as notable trainers and mentors Mike Doyle and John Tammaro Sr. In 1994, Carroll stepped out on her own and not long after won her first race with Lilac Charm. The following spring, Carroll won her first stakes (’95 Woodstock Stakes) with Tethra, who was owned and bred by the Eaton Hall farm. Her first graded stakes win came in 1999 when Swingin On Ice secured the Grade 2 Beaumont Stakes at Keeneland. While that win proved to be one of the highlights in the grey mare’s career, it was simply the first piece of glitter that would decorate her trainer’s resume. To date, the veteran conditioner has captured 44 graded stakes wins while amassing close to $45 million in career earnings. If stats could really speak for themselves, they would most likely say Carroll has mounted a charge more than worthy of a plaque in the Hall of Fame. On career earnings alone, the trainer started her career in the margin of $200,000. Last year, her runners earned close to $2 million. Moreover, Carroll has already cemented her name in the history books by becoming the first female trainer to capture the Queen’s Plate with Edenwold back in 2006. Five years later in 2011 she would reign supreme again, this time with a formidable filly named Inglorious. Her barn on the backstretch has not only housed Queen’s Plate winners but other top-level performers including multiple graded stakes winner Careless Jewel, 2014 Breeders’ Stakes winner Ami’s Holiday, 2016 Prince of Wales winner Amis Gizmo and graded stakes winner Ami’s Mesa, who ran a strong runner-up finish to Bar of Gold in the 2017 Breeders’ Cup Sprint. This list could go on, but it’s safe to say there are many good horses gracing her past and present roster. Not to mention that Carroll has three horses up for Sovereign Awards this year – outstanding two-year-old nominee Avie’s Flatter, champion older female contender Gamble’s Ghost and champion female sprinter nominee Moonlit Promise. Asked about some of the highlights of her storied career thus far, a couple victories are etched at the forefront of her memory bank. 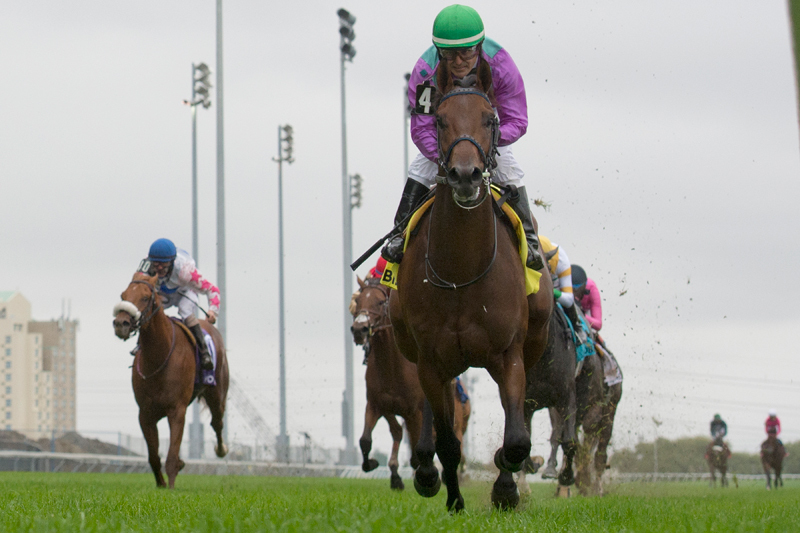 This year, Carroll’s barn has a solid Queen’s Plate contender in the likes of Avie’s Flatter. Bred and owned by Ivan Dalos, the bay colt posted impressive wins in both the Coronation Futurity and Cup and Saucer at Woodbine last season. Starting off this year on a very flattering note, the three-year-old colt recently secured his first graded stakes in the Grade 3 Kentucky Utilities Transylvania Stakes at Keeneland. While Carroll has no shortage of good horses in her barn, she is quick to point out that there is something very special about this colt. Asked about his next start, the veteran conditioner is prompt with an answer. As Carroll prepares the young colt for yet another exciting race before the Queen’s Plate, she acknowledges that a pivotal factor in her continued success is the various partnerships with the owners and breeders in the racing business. Alongside partnerships with Dalos and Sikura, Carroll has additionally trained for owners such as Eugene Melynk, Padua Stables and Donver Stables. Carroll also credits her continued success to the people working with her at the barn. “You know I can’t tell you the truth – I know more than seventeen years. I used to be an exercise rider for her first and then I started to pony and then hot walk. I’ve been working seventeen years doing everything here because she is a good trainer and I figure she needs good help,” said Orrett, who exercise rode Carroll’s Queen’s Plate winner Edenwold as a two-year-old. A commitment to the racing life can be tough, especially given the early and long hours that are required on the job. Working on the backstretch isn’t dictated by a systematic punch clock, but rather by factors such as the specific needs of each horse, the number of horses a trainer sends out in the morning and even something as simple as mother nature. Yet, Orrett continues to enjoy the day-to-day grind and takes each moment in stride. Willow Bunch captured both the 2003 Jammed Lovely and La Lorgnette Stakes, and yet again is just another stakes horse to add to the list of Carroll’s phenomenal runners. Currently, Carroll has 30 horses in her barn, with more to ship in as the 2019 racing meet steadily approaches. No doubt, spending over four decades in the industry requires a continued hustle and commitment from Carroll. Unlike other sports, horse racing is subject to an ever-changing landscape – partnerships dissolving, racetracks disappearing or simply different players in the game. With that said, working in the industry requires a resilient personality to navigate the sometimes-precarious nature of the sport. So, why does Carroll keep coming back for more? Poised and always to the point, Carroll’s Hall of Fame induction not only signifies her outstanding contribution to the sport of kings, but the immense heart, ardent attitude and competitive will it takes to both survive and thrive in this game.